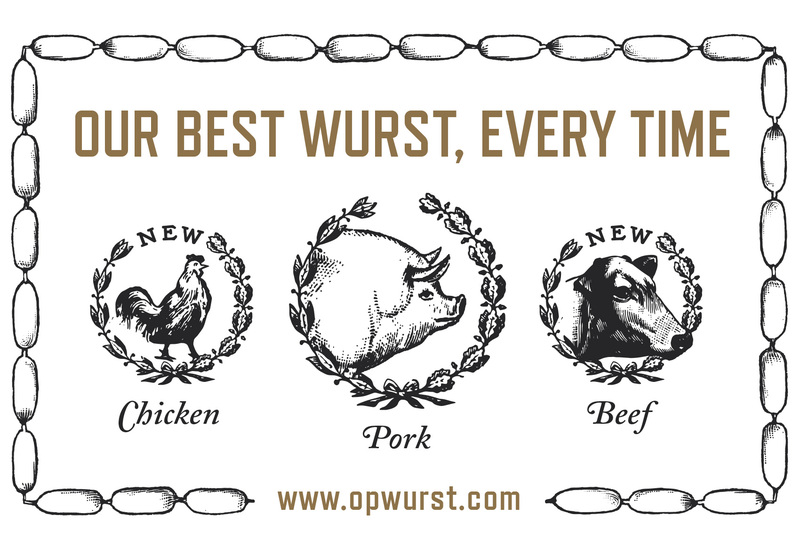 Drum roll please…for the opening of OP Wurst Division! 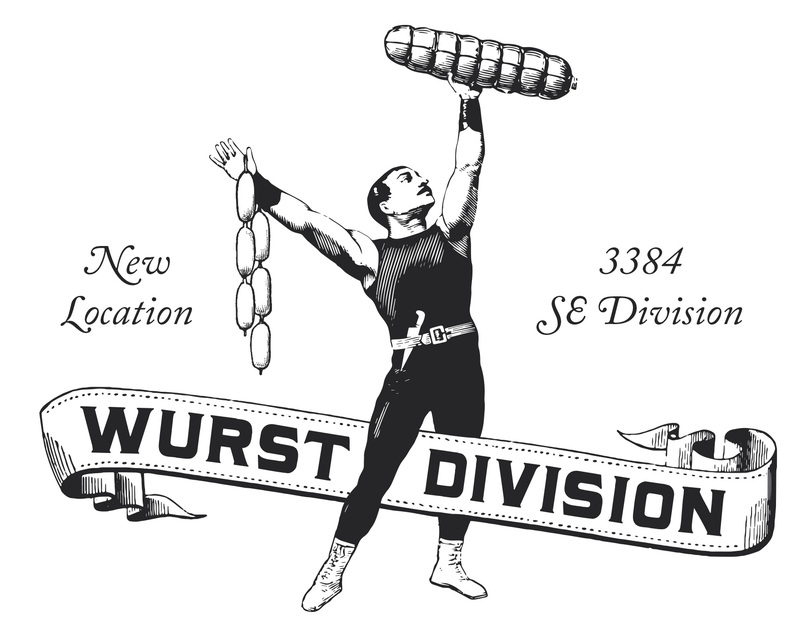 Olympia Provisions’ offshoot restaurant series, Wurst, now has a new location on 3384 SE Division street. A renovation of the old Honky Tonk Taco building turned a teal & red taco joint into a high end sausage bar. You heard it – a high end sausage bar. The Bureau assisted by providing brand & signage suggestions including establishing a simple white, black and gold palette that takes advantage of the interior’s natural wood accents and a restrained use of signage combined with custom composed old-time woodcut illustrations. 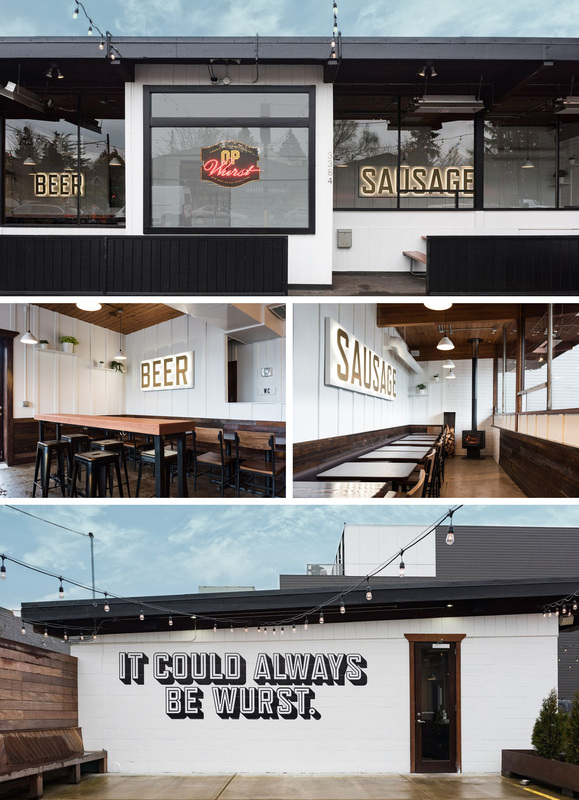 An outside patio mural boldly shouts a simple message to people near and far: It could always be wurst. Speaking of which, the menu has a plethora of hot dog options from traditional to way-out-in-left-field (there are even a few menu options for veggie lovers). In conjunction with the opening, Olympia Provisions is also expanding their sausage options from the standard pork to include both chicken and beef sausages. So hustle on over to Wurst Division and try a traditional dog or an experimental twist on the classic wurst. 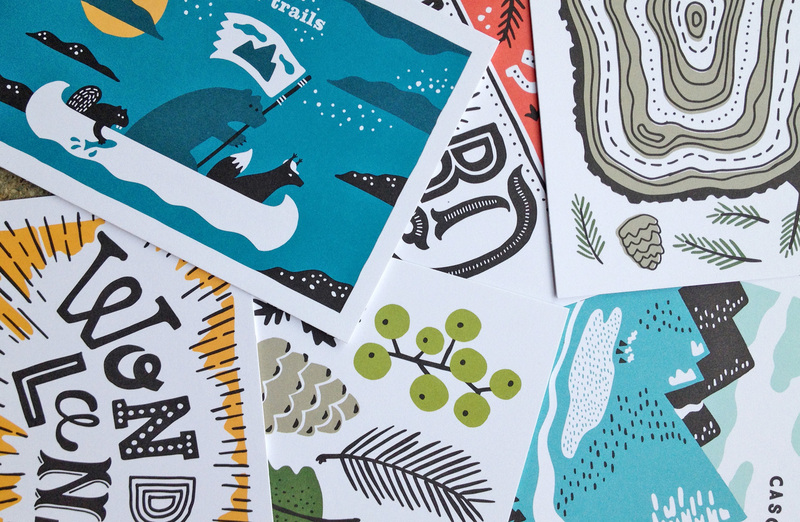 Here is the sixth and last card in a series postcards I illustrated for Umpqua Bank. They were used at the Portland Business Journal Luncheon and Seattle Design Series, mixed and matched in sets of 3 and delivered in a custom envelope. 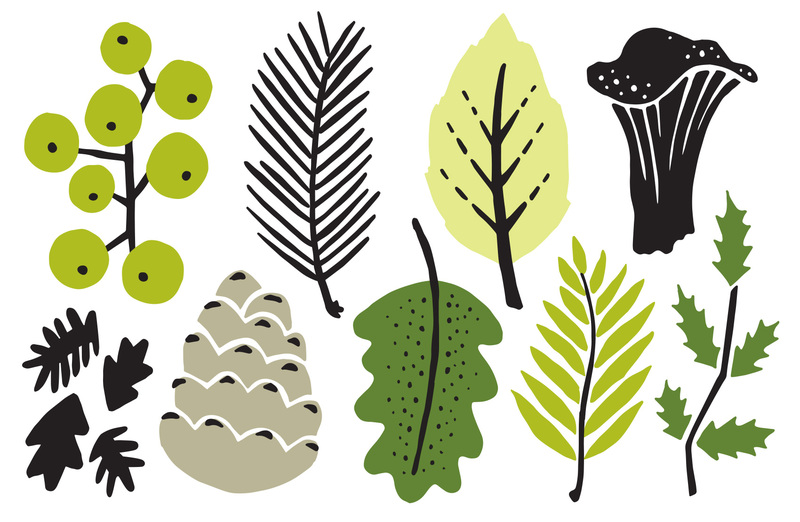 This card features NW-inspired foliage in shades of Umpqua’s lesser-used green palette. A series of large circular icons were created in a consistent style for reinforcing the tools being used. Mixing old visuals such as adding machines, retro clocks, will return signs and real live calendars adds a fun twist to using the online functions. The project scope included everything from tiny navigational icons to almost full screen illustrations, with over 30 assets created in total. Even virtual receptionists need their beauty sleep, so a bonus round of icons for indicating it was “after hours” was made. A cocktail glass option didn’t make the cut, but I believe that Ruby might just have a little fun on Fridays after answering your phones all week. 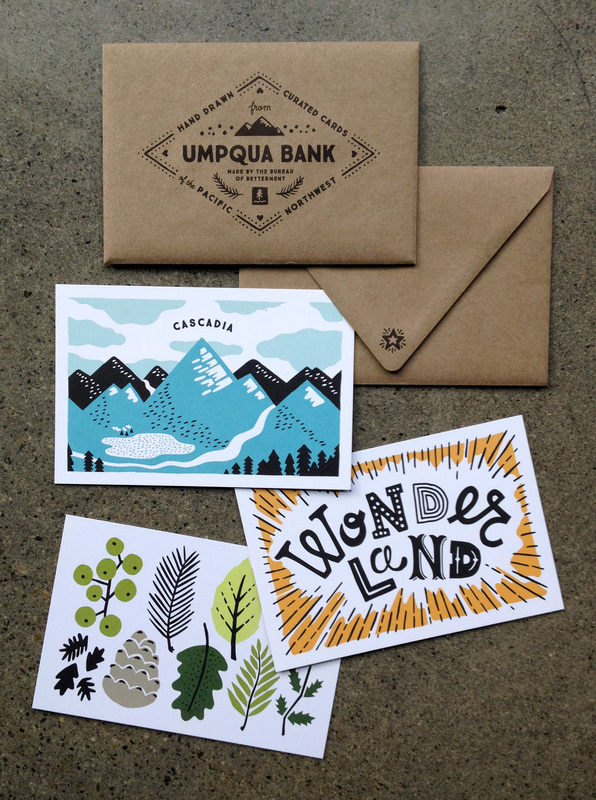 “Wonderland” is one of six postcards illustrated for Umpqua Bank with a Pacific Northwest theme. 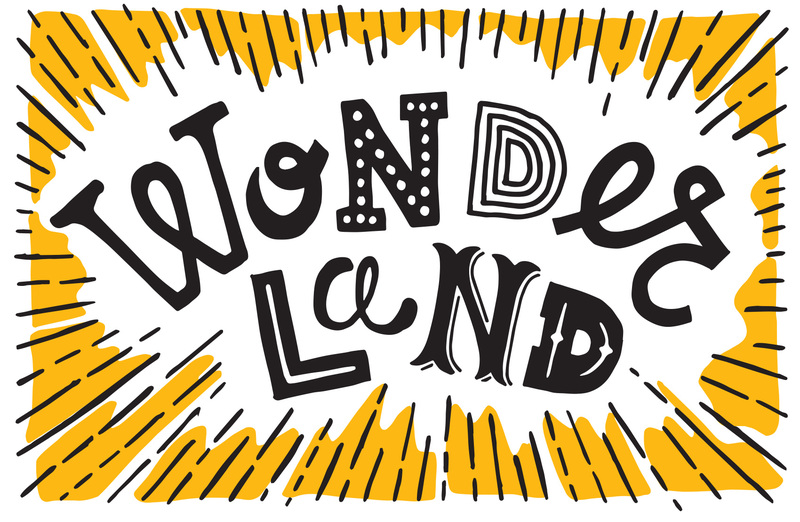 Derived from the old blue and yellow Oregon license plates that carried the slogan “Pacific Wonderland”, this interpretation came straight from the many childhood hours I spent with my dad in his 1979 red Dodge, traversing the roads of Central Oregon’s sunshiny plains. Feel free to grab and ice pack and sprain your tongue on that mouthful. I was once told that speaking Danish (my second language) was like talking with your mouth full of marbles, and that if it didn’t hurt just a little then you weren’t doing it right. 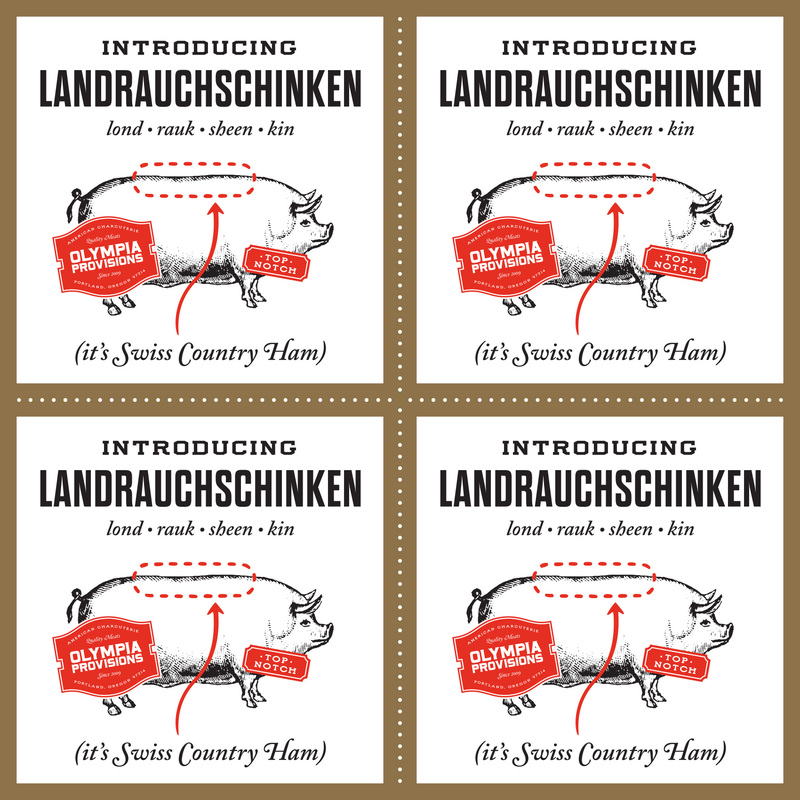 The Swiss must have been visiting Scandinavia when they came up with this moniker for Swiss Country Ham. Good thing you can order meat from the internet in complete silence, so if you like a cured pig loin soaked in burnt sugar and flavored with juniper and rosemary delivered straight to your doorstep with no intervention by the pronunciation police, then you’re in luck. Oh, here’s the little promo image I put together for Olympia Provisions social channels to promote their new product. Say it with me…LOND – RAUK – SHEEN – KIN.